I love boniato potatoes and whenever I see them around I hop to eating them. They’re less popular here nowadays than they were when I was growing up. One lunch time at my mum’s house I pulled this boniato potato stir fry together into a delicious meal that she and I polished off in two days. It’s colourful, simple and really tasty! I first made it a few months ago and it’s been in regular rotation since then. I didn’t know white sweet potatoes were called ‘boniato’ until I was in college. I didn’t even know they were special until I was in college. Growing up, the only sweet potatoes we ate were white. Imagine my confusion when I moved to the US and the ‘sweet potatoes’ I’d see in the dining hall and Thanksgiving media were orange. I thought those were yams? Is there some distinction between the two that I’m missing? Eventually I realised that the names are interchangeable. Then one day in a random food store I saw my beloved white sweet potatoes sitting quietly in a basket. I heard that stereotypical angelic singing in my head – I hadn’t eaten them in years! – and did a little dance in the aisle. The basket said these were ‘boniato’ potatoes, and I was thrilled that I now knew what to look for. It was exciting initially to explore the new flavour and texture of orange sweet potatoes. I was also happy to finally know what yams tasted like. They’re far moister, and less sweet than boniatoes. Slowly they made their way to foodstores at home, and my family’s kitchen. Now they’re everywhere. Going by restaurant menus they’re even more popular than their red-skinned relatives, and the days of boniatoes-only are a vague memory. Boniato potatoes are so good though, and I have a new appreciation for them now that yams have become so popular. 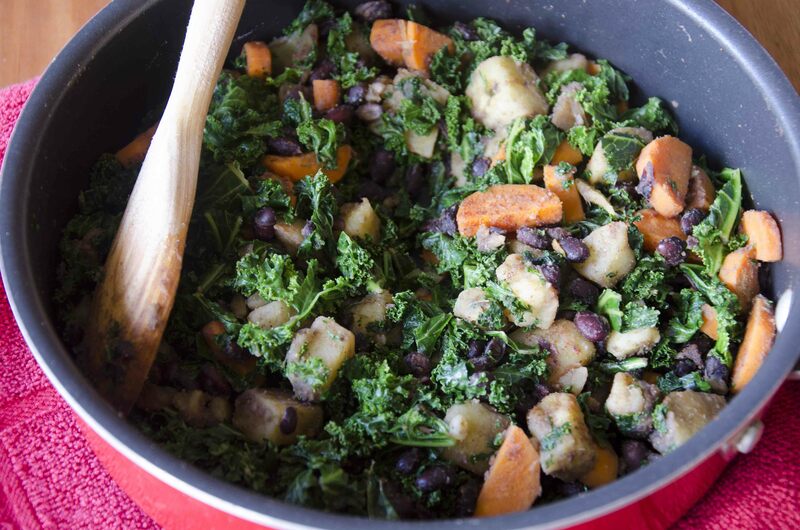 You know, all the health-minded people are like – sweet potatoes are a super food! 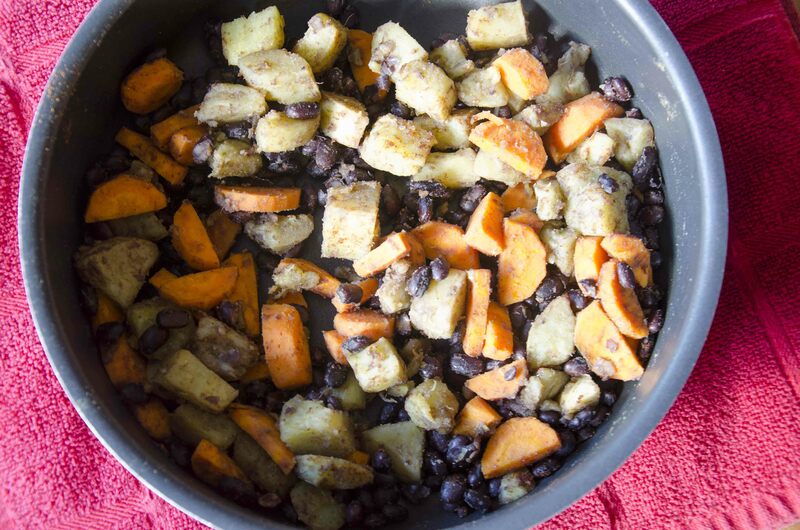 a great alternative to rice or regular potatoes! eat ’em! – and then there are pictures of yams. Show the boniato some love man! Going back to the boniato potato stir fry, the potato prep itself is easy. If you have leftover cooked potato, that’s great. Chop it up and you’re good to go. 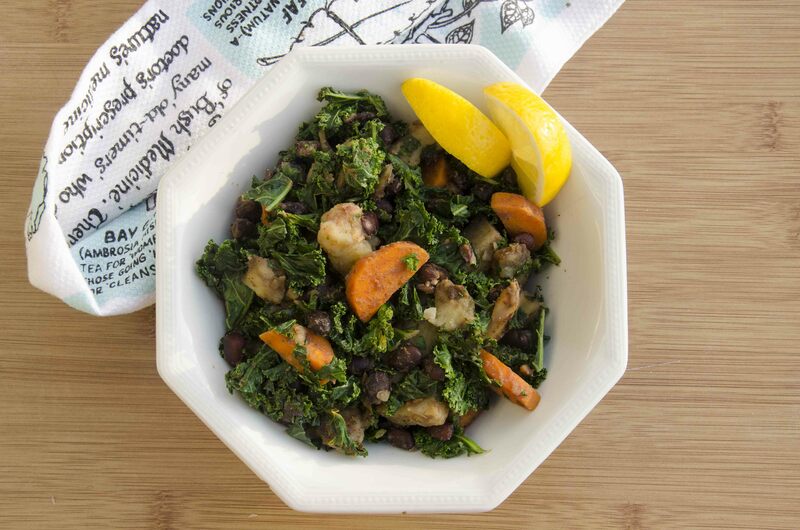 Otherwise cook the raw potato in a microwave while you’re prepping the other ingredients: a carrot, a bunch of kale, ginger and black beans. I boil my own beans, and for black beans in particular I add cloves of garlic, cumin and sometimes bay leaves to the water. 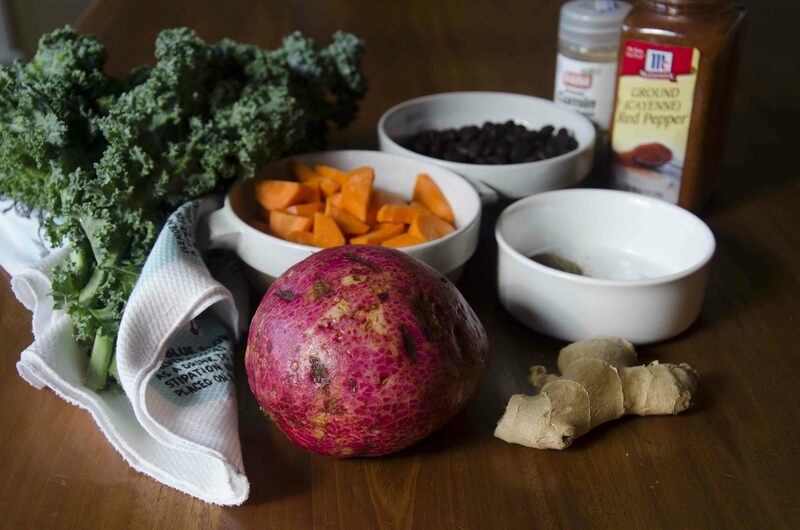 These add a wonderful depth of flavour and really complement the way I use my black beans normally. Using regular canned black beans is perfectly fine here though, so do whatever is easiest for you! Ginger and cayenne add a lovely warm spiciness to this dish. It’s on the pepper side, so depending on your tolerance you might want to start with no cayenne, or a 1/4 tsp, and work your way up from there. This boniato potato stir fry is totally more-ish (as Bahamians would say), and my mum and I gobble it up whenever I make it. It only takes one pan and it’s a meal in a bowl. Can lunch or dinner get any better? I hope you give it a try! Stab the raw potato a few times with a knife and put it in the microwave to cook, 8-10 minutes or until the knife goes easily through the centre. While the potato is in the microwave, peel and dice the ginger - you want about 3/4 of a tsp - and peel and slice the carrot. 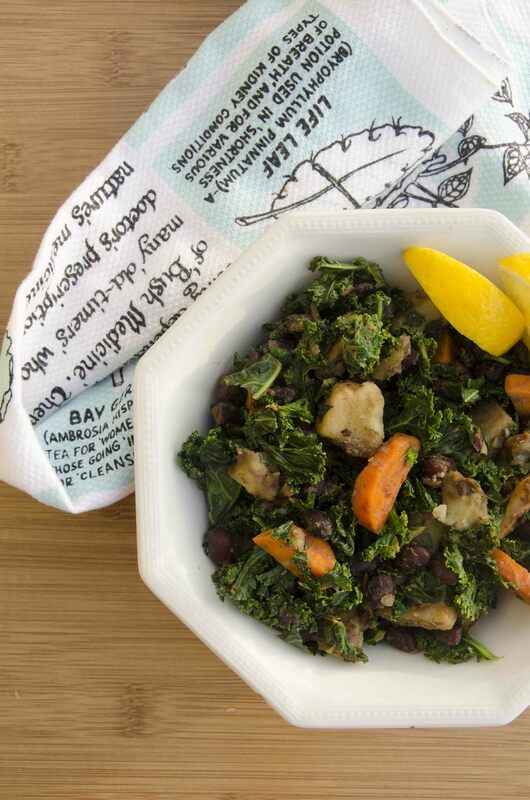 Chop the kale into bite-sized pieces. Once the potato is cooked through, peel and chop it into bite-sized pieces. Heat the oil in a large saucepan with a lid. Add ginger and carrot and let cook for 2 minutes, until the carrot begins to soften. Add the potato for 2 minutes, allowing it to crisp a little and the carrots to further soften. 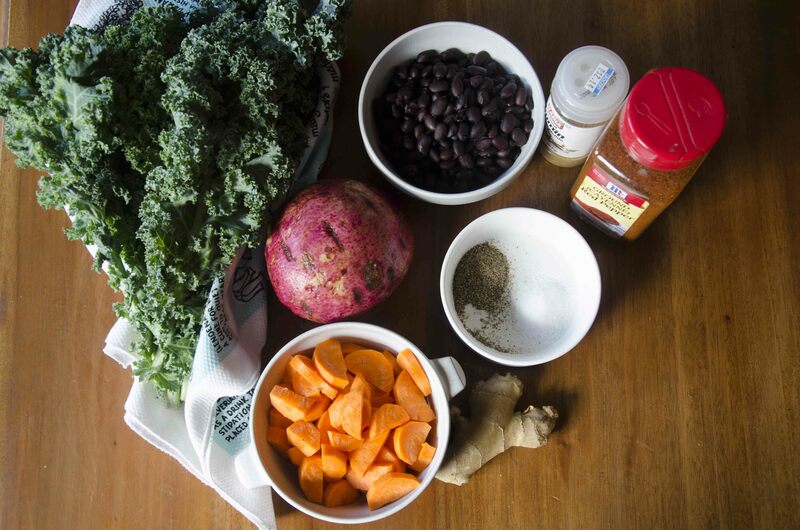 Add the black beans and spices, stir, and place the kale on top of the other vegetables. Cover the saucepan with the lid and allow the mixture to steam. After 3 minutes, stir the mixture. Put the cover back on the saucepan and allow to steam for another 3 minutes. Remove the pan from the heat and sprinkle the mixture with lemon juice to finish. *I’ve made this with both fresh and dried ginger, and both work well. If you’re using powdered ginger start with a 1/2 tsp and go from there.